Great blue herons are very large birds. They’re four feet tall with a six-foot wingspan and weigh over five pounds, yet they nest in rookeries high in the trees. The nest is the focus of their family life. Because they are seasonally monogamous, their first order of business when they return in the spring is to attract and court a mate. They do this at the nest with elaborate courtship displays initiated by the male. Before he has a mate he circles the rookery in exaggerated, laborious flight, then lands with his head and neck plumes erect and croaks his Landing Call. On the nest he does the Stretch Display, extending his neck and raising his bill to show off his beautiful throat plumes, then lowering his head and moaning. He preens his wing. He fluffs his neck. He raises his crest. He grabs a twig on the tree and gives it a shake. He does his utmost to get noticed! When a female heron agrees to be his mate their displays become elaborate duets. 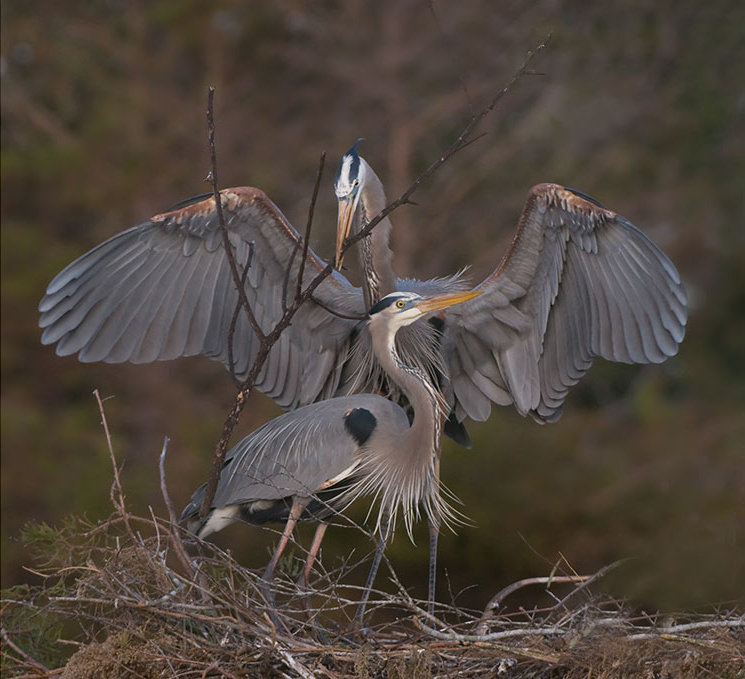 In the Greeting Ceremony a heron returning to the nest where his mate is waiting will give the Landing Call while his mate does the Stretch Display. The Stick Transfer ceremony is an exaggerated drama of nest building. The male arrives with a stick for the nest. The female does the Stretch Display and takes the stick while he rapidly claps the tip of his bill at her. Then she places the stick on the nest. Ta dah! They even have a ceremony for Nest Relief. The arriving heron gives the Landing Call, his mate on the nest does a Stretch Display, then they both clap the tips of their bills and sometimes preen. 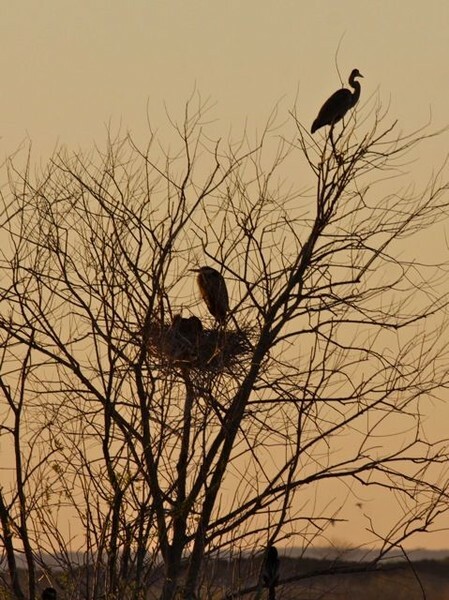 If you watch at a heron rookery you’re most likely to see these displays at dawn or dusk because the females leave the area during the middle of the day. So plan your next adventure for early morning and have a heron sunrise. p.s. Click on the imbedded links above for photos of the courtship displays or click here for a photo sequence. I was watching this today, around 7pm, quite a few males circling the rookery, and croaking quite loudly…..the red tailed got tired of the display and took flight to a new by perch, this only lead to much louder sound! Very entertaining show this evening. Kudos to you as always, Kate, for your insightful commentaries. My husband thinks I know much more than I do about birds, but I always tell him I’m paraphrasing what I learn here. Major kudos also to the guys/gals who take these marvelous pictures and allow you to share them with us! This picture is now my screen saver, if that’s ok with the photographer? This doesn’t relate to the herons but to Tasha2 at the Gulf Tower. Everytime I have checked in the last week, the eggs have been there but no adults. I know the adults do come and go a bit but I’m getting worried. Has the nest been abandoned? The nest has not been abandoned. More news is coming today.